In the last year, there has been little mention of the Security and Prosperity Partnership (SPP) from the governments of Canada, the U.S., and Mexico. A battle appears to be brewing as to the next course of action to take in regards to North American integration. Some would like to see more focus placed on Canada-U.S. bilateralism while others believe that trilateralism should always be the way to go. This could be a manufactured debate with the goal of trying to resurrect this agenda. You can be sure that the global elite pushing for deeper continental integration, will take a North American Union any which way they can. It seems to always be the same people championing for further North American integration, but with the decline of the SPP, a rift may be emerging. Recent op-eds that appeared in the Globe and Mail back this up. On one side, you have former deputy foreign minister of Mexico Andre's Rozental and Robert Pastor, who is considered by many to be the architect of a proposed North American Community. They argued in favor of trilateralism. The bilateral side was represented by former Canadian deputy prime minister John Manley and Gordon Giffin, former US ambassador to Canada. They believe that the trilateral framework of NAFTA should not apply to all aspects of North American relations. It's hard to take this apparent quarrel too seriously as all have participated in past reports and policy paper initiatives pushing for expanded North American integration. It could be a legitimate power struggle and infighting, brought about by a clash of ideas on how to best achieve these objectives. It might also be nothing more than staged theatrics designed to try and jumpstart continental integration, in an effort to fill the void left by the SPP. In an article from February of 2009, former international trade and foreign affairs minister David Emerson, appears to be talking out of both sides of his mouth. He feels that NAFTA has made Canada "U.S.-centric" and as a result, it is losing ground in the rest of the world. At the same time, the article also reports that Emerson has, "called on the government to aggressively seek stronger Canada-U.S. ties, up to and including a customs union. He said at minimum, Canada should advocate a North American security perimeter arrangement, a labour mobility agreement that modernizes NAFTA provisions, and greater integration on regulatory matters." Emerson is now calling on Canada to lead a new charge towards greater continental integration. He believes that the North American partnership is in need of repair and has proposed Project North America. The former senior cabinet minister insists that Canada needs to work more closely with the U.S. in areas of trade, energy, the environment, and continental security. Emerson said, "I think the process of integration has to begin with the two leaders, perhaps three." He is also against revitalizing SPP working groups which have been for the most part, inactive since Obama became president. Before the SPP Leader Summit in New Orleans in April of 2008, it was reported that there may be a move to try and shove Mexico out of the SPP. Former Canadian ambassador to the U.S., Derek Burney stated, "Attempts to 'triangulate' in recent years, by bringing in Mexico, have produced little of substance and allowed attention to be diverted from more pressing bilateral concerns." In an article from October 2008, John Ibbitson proposed that Prime Minister Stephen Harper pursue a new Canada-U.S. environmental, security and economic accord with the incoming administration. He said, "Mexico, unfortunately, should not be part of this conversation-it's not far enough along." In January of this year, the Carleton University Canada-U.S. Project was released to the public. It acknowledged the failures of the SPP and called for wholesale changes. It also blamed the sometimes unnecessary inclusion of Mexico from preventing more meaningful Canada-U.S. bilateralism. The report called for Canada to pursue a NAFTA policy of trilateralism when necessary, but on certain matters, Canada-U.S. bilateralism should be the priority. In February of this year, the House of Commons Standing Committee on Foreign Affairs, was told that the controversial SPP was likely dead. CEO and president of the Canadian Council of Chief Executives, Thomas d'Aquino, testified and answered questions before the committee. He admitted that it was probably only a matter of time before the SPP was replaced. He emphasized the importance of Canada-U.S. bilateralism, but cautioned against cutting Mexico out of the equation. 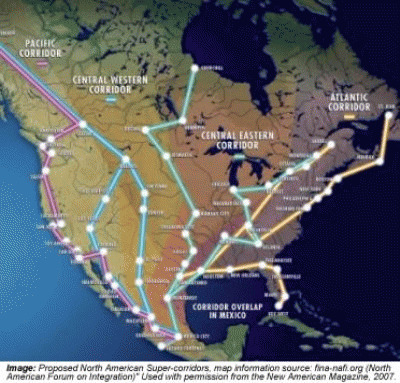 In an article from several months back, Jerome Corsi writes that, "while North American integration advocates may have backed off promoting the Security and Prosperity Partnership of North America as their vehicle to create a North American Union, the globalist effort to integrate North America economically and politically continues under different names." The SPP has been a huge public relations nightmare, thanks in part to many who have exposed its agenda. The lack of transparency, coupled with the fact that there was never a mandate from the people of Canada, the U.S. and Mexico, can also be blamed for its undoing. The vision of a North American Union has not been abandoned and plans for deeper integration continue on many different fronts. The global elite can never be accused of letting a crisis go to waste. Some are using the swine flu pandemic scare as a means to push for further continental integration. We might only be a crisis or two away from a North American Union.